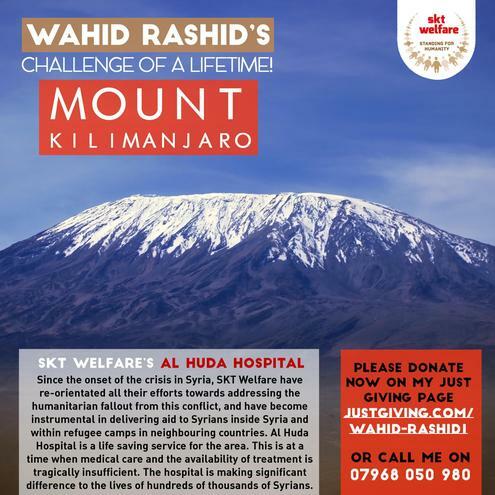 After spending a week in Novemebr with the SKT Team in Turkey near the Syrian boarders and seeing the devastated state of the Syrian Orphans and families, I have decided to the biggest challenge of my life which is to climb Kilimanjaro in Jan 2016, to raise money for SKT. It will take us 5 days up and 2 days to come back down and for those who know me there are no fast food joints on the way up lol. For the serious stuff, I am taking up this challenge to support one of the biggest human crisis that the world has seen. SKT Welfare's Al Huda Hospital is a life saving service for the area. This is at a time when medical care and the availability of treatment to the Syrian people is tragically insufficient. Al Huda Hospital stands as a beacon in this regard, and is making significant difference to the lives of hundreds of thousands of Syrians. It is a massive undertaking with significant costs attached which cannot continue to operate without your sustained support and donations. We need your help to address the ongoing healthcare needs of the surrounding areas. SKT Welfare have 100% donations policy and Is an International NGO Registered Chairty. SKT Team are doing some ground breaking work for the people of syria including setting up hospitals to education centres. Please help me help SKT to help support this cause.